Jacqueline Larson’s New Book “Group Home Cookbook” is an Inspired and Brilliant Cookbook for Group Homes, Families, and Those with a Modified Diet! Recent release “Group Home Cookbook” from Page Publishing author Jacqueline Larson, M.S., R.D.N. is filled with tantalizing recipes that are perfect for feeding a crowd with a variety of diets. 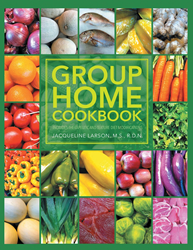 Jacqueline Larson, M.S., R.D.N., a passionate cook and accomplished author, has completed her new book “Group Home Cookbook”: a scrumptious collection of recipes to feed the masses while sticking to their strict dietetic regimens. Jacqueline Larson M.S., R.D.N. is a consultant, registered dietitian nutritionist specializing in meeting the nutritional needs of Special Children and Adults. She has worked as a consultant dietitian for Skilled Nursing Needs, Assisted Living and Group Homes for the Developmentally Disabled in long term care since 1986. As her business grew she realized her passion for working with individuals with special needs. Jacqueline has since focused her growing practice on individuals with Special Needs. Jacqueline self published “The Group Home Cookbook” first edition, in 1991. The cookbook was developed to assist group homes in preparing delicious, nutritious, economical meals. After the success of her first cookbook, Jacqueline developed the second edition adding an additional one hundred recipes. The cookbook, is the 3rd Edition and features even more recipes. The book also works with available group home menus and Prader Willi Syndrome menus which can be ordered online on her website consultantdietitian.com. Published by New York City-based Page Publishing, Jacqueline Larson, M.S., R.D.N.’s comprehensive recipe book aids in cooking a delicious meal while still adhering to the strict dietary needs of those dining. Individuals with special needs can benefit from following individualized diet plans. The appropriate diet plan can be prepared to prevent allergic reactions, ease the chewing and swallowing, treat a chronic condition such as renal failure, hypertension, or reflux or even as preventative for disease such as heart disease, diabetes or cancer. For people who have chewing and swallowing difficulty providing a texture modified diet may be essential to preventing choking or aspiration. For individuals with food allergies or food intolerances, consuming certain foods can trigger annoying irritation or even a life threatening attack. For those who have chronic renal failure, a therapeutic defined renal diet can impact the progression of the disease. The “Group Home Cookbook” is comprehensive and is especially designed for group homes. Each recipe in the cookbook provides guidelines for providing therapeutic and texture modified diets in a group home setting or any home setting. The recipes are delicious, simple, easy and economical to prepare. The cookbook simplifies the task of preparing special diets. Each recipe also includes food safety and quality instructions. The therapeutic diet guidelines include lowfat, diabetic, anti GERD, renal, sodium controlled and gluten free diets. The texture modified diets include chopped, ground and puree diets. The recipes include alerts for wheat, milk, eggs, fish, soy and nut allergies. Preparing meals for specialized diet plans can be challenging. The “Group Home Cookbook” easily explains how to prepare specialized delicious and healthy meals. The guidelines in this cookbook, approaches the use of specialized diets with the latest medical and scientific research. “The Cookbook is great for personal use as well as for Group Homes. I bought one for myself and just love it, as well as it is wonderful for the company I work for. Clients are always pleased with their meals and their weights are stable,” states Joanna Hamilton RN. "I use Jackie Larson’s cookbook every semester with my dietetics students. It's an invaluable training tool for hands-on experience with therapeutic diets and modified food textures," says Beth Blake, MPH, RD DT program director. Readers who wish to experience this highly useful work can purchase “Group Home Cookbook” at bookstores everywhere, or online at the Apple iTunes store, Amazon, Google Play or Barnes and Noble.